Experience what life was like for New England farmers and villagers in the middle of the 19th century at this interactive living history experience. Costumed character actors bring the working farmstead and recreated village to life with craft demonstrations and interpretive exhibits. Ride the historical carousel or hop on a horse-drawn buggy. Tour a Colonial Revival stone barn and see heritage livestock in the petting zoo. 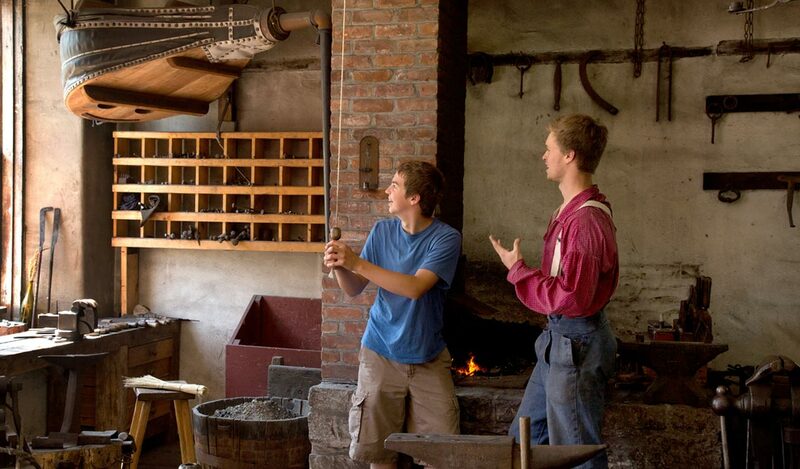 Visit more than a dozen historic buildings, including a smokehouse and blacksmith shop. See the one-of-a-kind Cardiff Giant statue and explore a vast collection of genuine artifacts from one of Brooklyn's oldest farming families. Get a taste of what Upstate New York felt like circa 1845. Open Sundays only 8:30 a.m. to 2:00 p.m.
Open Tuesday - Sunday 10 a.m. - 4 p.m.
What daily activities are there at the Farmers Museum? Farm activities change with the season and may include sheep shearing, wool weaving, animal feeding and care, and harvesting hops. Ride in a horse-drawn carriage and see blacksmiths, farmers, and candle makers at work. What are some of the historical objects at the Farmers' Museum? Discover 23,000 authentic items including plows, carriages, butter molds, spinning wheels, woodworking tools, hand planes, quilts, and homemade textiles. Find a mid-19th-century blacksmith shop, a printing shop, a tavern, and a well-stocked general store.